Iris douglasiana photographed on Tomales Point, Point Reyes National Seashore, California. Photograph taken 3rd April 2004 by Stephen Lea This reduced image placed in the public domain 9th April 2004. When I was studying theatre in the 90s, there was one tiny florist across the street from campus, its windows steamed to opacity. They stocked the usual carnations and roses, and the very unusual iris. We loved those irises; they stood out so from the bouquets brought in by relatives and friends outside of the department. Tall, graceful, and purple-blue, they were odd, charming, and undeniably gorgeous. They soon became the favored flower to buy for fellow actors. Iris is one of the most important flowers in the North American repertory of flower essences. It is said to represent the connection between soul and matter, the “rainbow bridge” that connects our feelings to our experience of the physical world. Suffused with color, the tall flower represents our need to “create and cultivate beauty”. Two different species of iris are represented by flower essences. 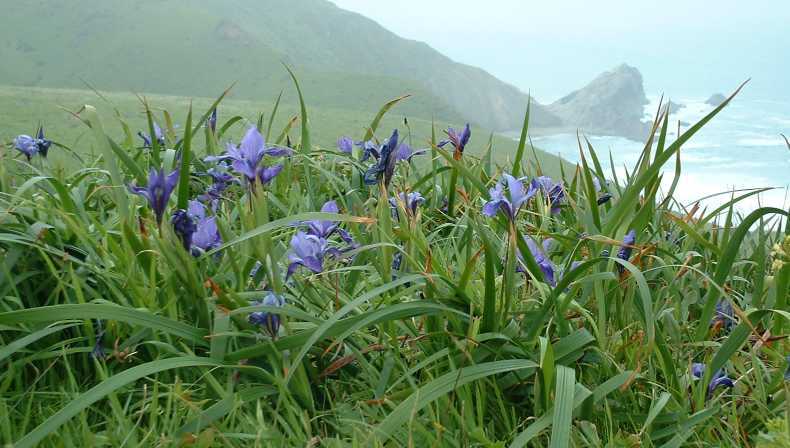 Iris douglasiana is a native of California and the western coastal regions, and is primarily known for its wild beauty. Blue flag flower close-up (Iris versicolor). Photo taken by Danielle Langlois in July 2005 at the Forillon National Park of Canada, Quebec, Canada. GFDL, CC3.0. The second species, Iris versicolor, is also known as Blue Flag. This plant is native to North America. In the native North American herbal tradition, its rhizome—a horizontal root or root-like structure—was used as a poultice on swelling, sores, and bruises, to treat rheumatism, and to remove freckles(!). Modern herbalists use the rhizome of I. versicolor to increase lymphatic circulation. I should note that blue flag is what herbalists call a “drop-dose botanical”, meaning that it is toxic, and should be used with great caution and in tiny (“drop”) doses. The name “flag” is said to come from the use of iris as a heraldic emblem. The fleur-de-lis, emblem of France, is a representation of Iris pseudacoras, the yellow iris native to this part of Europe. The three petals of the iris represented faith, wisdom, and valor. Today I. pseudacoras is used in water treatment plants, its rhizomes growing in substrate and filtering toxins from the water as the sunny flowers rise above the muck. Beautiful, useful, and indefatigable, I. pseudacoras has become an invasive plant across the United States. These stately yellow flowers out-compete other plants, taking over waterways where they are planted; they can even displace cattails. Difficult to expunge completely because pieces of rhizome have the ability to generate a new plant, the preferred method for removing yellow iris is to burn it to ash. The homeopathic remedy derived from Iris versicolor is thought to have a special affinity for the pancreas and other exocrine glands, and to be of special use in cases of hypoglycemia—low blood sugar. The particular symptoms of hypoglycemia associated with homeopathic Iris are feelings of tiredness, moodiness, and dizziness after going more than a few hours without food. So with Iris we see several themes emerging. There is, of course, the theme of stunning beauty, a color so pure and intense that it lifts the spirit, combined with a harmony of form that reminds us that life is about more than survival. The name “Iris” comes from Greek mythology. Iris was the messenger of the gods, the female equivalent of Hermes, who traveled via a rainbow. (The word for rainbow in Spanish is “arcoiris” and this is, of course, the name of an ice cream company and so appears on peddlers’ carts in cities and towns across the Americas. The messengers of Iris bring ice cream sandwiches and popsicles). One of the other duties of Iris was to lead the souls of dead women to the Elysian Fields—there’s that rainbow bridge again. Because of this, irises were often planted on the graves of young women. The Catholic tradition associates blue irises with the Virgin Mary and the Immaculate Conception. Purity, protection, and grief are thus added to the flower’s meanings. 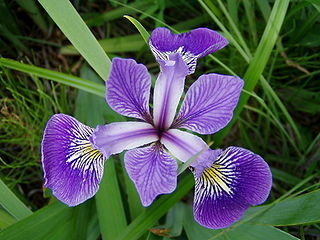 Iris has also been seen as a symbol of eloquence. The flower itself seems to be speaking, its lower petals drooping towards the ground and its “throat” open wide. A subset of iris species are known as “bearded iris”, for the hairs that appear to form a goatee on the descending sepal.The arrangement of the flower provides a perfect platform for pollinating insects, and the architecture is such that the insect leaves behind pollen from other plants on its way to the nectar contained in the plant’s throat, then brushes against the host plant’s pollen on the way out, thus providing for transfer of pollen from plant to plant. Iris is a resilient plant. It propagates asexually as well as through cross-pollination, spreading by sending its rhizomes along the surface of the soil. Each rhizome will produce a new stem, and each new stem can produce more rhizomes. When separated from the original plant, a rhizome will simply produce a new plant. Chopping up the roots thus allows the plant to reproduce even more. Not a bad quality to have, turning assault into reinforced strength. Iris turns toxicity into beauty. Yellow iris in particular is a natural filter, pulling metals and toxins from the water in which it is planted. Blue flag tincture is given to enhance the body’s filtration through the lymphatic system. Iris flower essence is given to counteract feelings of dullness, to bring inspiration where it is lacking. Morpheus and Iris, painted by Pierre-Narcisse Guerin, 1811. Public domain. Anatomically, iris refers to the colored portion of the eye, also named for the rainbow and her messenger. This is the part of the eye that responds to light intensity, constricting to narrow the pupil in bright light and expanding to allow more light to enter the eye in dim lighting. The iris of a camera imitates this effect with overlapping blades that can narrow or widen the aperture of the lens. Designs made by overlapping sheets of paper or other layers in a circular fashion are referred to as “iris” designs. Iris is intimately involved with seeing. Iris, in essence, represents the ability to see the beauty that is all around us in this world; to see it, and to express it so that others may see it. A beautiful, resilient transformer of toxicity into beauty, iris is truly a fitting flower for an artist. For more on the botany of Iris, see botany.com or any University botany information site. 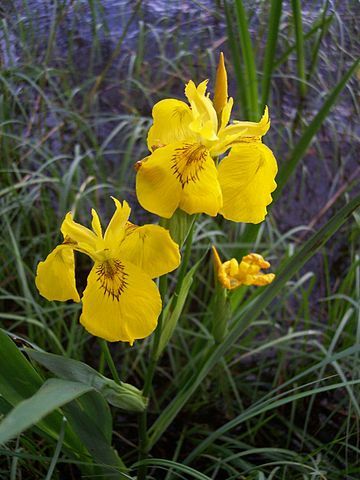 For more on Yellow Iris as invasive plant, see the USDA profile. Flower essence information drawn from The Flower Essence Repertory, Kaminski & Katz, published by the Flower Essence Society. Homeopathic information comes from the book Prisma: The Arcana of Materia Medica Illustrated, by Frans Vermeulen. If you have questions about Iris, please contact me. Thank you! What a lovely & helpful article. Beautifully written!